Review: Before you read this review, make sure you have some general idea about how I feel by reading my rant. I enjoyed Crescendo. I have MAD love for Becca Fitzpatrick for many reasons. She’s right up there with Kiersten White. HOWEVER, Crescendo bothered me a little. 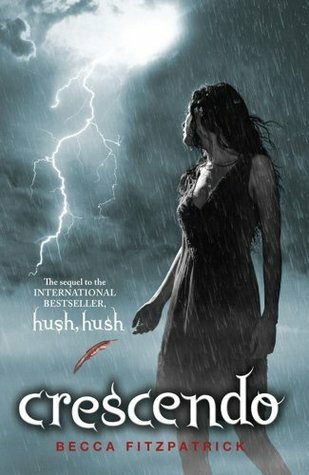 In Hush, Hush there is PLENTY of romance. I would categorize it as a romance novel with a paranormal sub-genre (did you read the rant?). And it does a pretty good job of balancing the two. Even though I didn’t like Nora’s relationship with Patch, I was able to enjoy the freaky paranormal aspects enough that I ended up really liking the book. Not so much with this one. This book suffers from what I call the “sequel-phase” of a romance. I discussed this with my friend Debbie for some time, and she was of the mind that this phase is unavoidable. I’m starting to agree with her. This book is still getting the same rating as Hush, Hush though because I ADORE Becca’s writing style. She could write about cow-pies and I would still be interested. I might not LOVE it, but I would definitely read it. Oh dear. I guess now I should clarify that this book is MUCH better than cow-pies. Bad example. Ha you're so cute! I love your rants, and I love your reviews. I still haven't read any books from this series, but I've been itching to get my hands on them. At least now I'll know what to expect! Keep up with the awesomeness--you rock at it!